[dropcap size=big]A[/dropcap]dapting the short stories of H.P. Lovecraft for any other format is tough. If you’re unfamiliar with the writings of this patron saint of goose bumps, you shouldn’t be, just imagine Stephen King, only scarier. But Lovecraft wasn’t a Shock Master. Stephen King is the great master of this method. 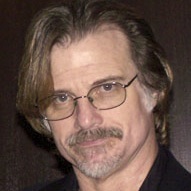 He can succeed in seducing his readers into accepting the “comfort zone”, and skillfully manipulates them into an emotional investment with the central character of that scene, before pulling the floor out from under them with that character’s abrupt and usually grotesque demise; and manages all of this in the space of one short paragraph. But this is not Lovecraft’s method. His terror is a creeping that comes over a reader like a dank fog on a moonless night. He takes you by degrees, slowly, and deeper into a world of his own conjuring until the reader realizes too late he’s been lured into the abyss of the “Old Ones”. King’s craft is visual, Lovecraft’s is tonal. King’s art is revelatory. His terror springs from what his reader is “shown”. In reptilian parlance King is a viper. Lovecraft’s art is atmospheric; terror emerges from the mood weaves and what the reader is not shown. Lovecraft is a constrictor. The visuals that King devises can be easily translated to other media. Cujo is a rabid, murderous beast on the page or up on a movie screen. But how does one capture the miasma of Lovecraft on the stage? How does one represent “other worldly geometry”? The Visceral Company’s production of “Lovecraft: Nightmare Suite” at the Lex Theatre is rough and somewhat tattered about the edges, but producer Drew Blakemen and director Dan Spurgeon have nevertheless succeeded where many others have failed. “Lovecraft: Nightmare Suite” is inventive, spooky, clever, entertaining, but most importantly it is Lovecraftian. 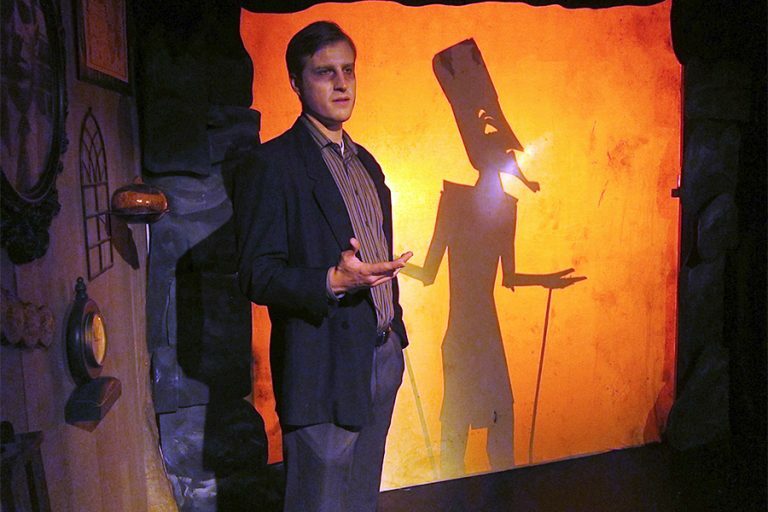 Employing puppetry, shadow theatre techniques, and approaching the material as Story Theatre the evening consists of six short pieces intelligently chiseled from Lovecraft’s writing, which are framed by Frank Blocker doing a tasty turn as Howard Phillips, Lovecraft’s narrative doppelganger. The tales are well chosen. Mark Souza and a perfectly demented Steve Peterson get high marks for creepiness in “The Picture in the House”. “Cool Air” benefits from Angela Sauer’s compelling presence, Mark Souza’s expressive “non-presence” and some deliciously fun theatrics. And the talented Devereau Chumrau deftly delivers Lovecraft’s “The Cats of Ulthar” a morality tale dear to the hearts of all us cat lovers. Now unfortunately this production is closing all too soon, but Blakeman, Spurgeon and company seem dedicated to producing theatre with horror and sci-fi themes and subject matter. On their roster for this year you’ll find “Recall” by Eliza Clark slated for March, described as the story of a mother’s struggle to protect her psychopathic daughter from being “recalled” by a totalitarian government. “Zombies From the Beyond”, a “musical comedy send-up of 1950s B-movies” is scheduled for May, and come September another Lovecraft adaptation, “The Call of Cthulhu” featuring Frank Blocker. If you ask me, these shows sound like more fun than being a ferret in Jennifer Connolly’s lingerie drawer.